Massimo's Photoblog: Did We Found the Aliens? Well, most likely not. But before addressing the alien situation, let me first take a step back. It all started with the Kepler SpaceTelescope, NASA’s facility tasked with finding worlds orbiting other stars. The spacecraft worked beautifully: since its 2009 launch it has already found 1041 extrasolar planets, with thousands more waiting for confirmation. Even after surviving a near-death experience due to the failure of its reaction wheels (the crucial devices that maintain its precise pointing), Kepler is still churning out top science, discovering new planets and characterizing their stars. It is not one of the planets discovered by Kepler, however, that has astronomers around the world furiously scratching their head. It is a star, one of the 160,000 stars that Kepler monitored continuously for over 4 years during its main mission, that gave us the biggest surprise. 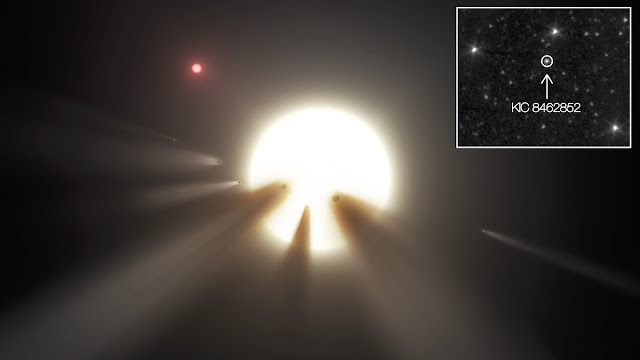 It turns out that this star, with the uninspiring name KIC 8462852 has been undergoing a “dimming” behavior so unique to start a veritable firestorm of speculations among the scientific community, and the public as well. The reason why this otherwise ordinary star is so special is that KIC 8462852 during some of its dimming episodes decreased its brightness by as much as 20%. This kind of behavior is normally associated to events where an opaque body (e.g. a planet) transits in front of its star, partially blocking its light. When that happens, however, the dimming is usually less than one percent, it repeats periodically, and has a very well defined ingress and egress profile. Whatever obscured the light from KIC 8462852, however, did it in a very disorderly fashion, managing to occult as much as 1/5 of the disk of the star. This is unprecedented, rising the intriguing possibility that the culprit could be some gigantic artificial structure being built around of the star with the purpose of intercepting its light and use it as the ultimate energy source. Such structures, known as “Dyson Spheres”, have been described as the next step of an alien civilization that, having outgrown its home planet, expands to occupy its entire planetary system. In this view the dimming episodes observed around KIC 8462852 would be caused by the elements of an incomplete Dyson sphere transiting in front of the star, as the structure is still being assembled. But, is this what is really happening around KIC 8462852? and our spectrum of KIC 8462852. As advanced as an alien civilization could be, it must still satisfy the fundamental laws of physics. And among such laws, are the principles of thermodynamics: if a Dyson sphere is intercepting a large fraction of the light from the star it surrounds, it must be heated in the process, and it must dissipate vast amounts of residual heat in the form of thermal radiation. To test this hypothesis, and to search for natural explanations for the unusual behavior of KIC 8462852, together with my students I have analyzed archival data from another NASA facility, the Spitzer Space telescope, designed to observe the cosmos in infrared light. Spitzer happened to observe this star several months after the last dimming episode detected by Kepler, offering the perfect opportunity to check for evidences of waste thermal emission from any structure closely orbiting the star. As shown in the analysis we published in the November issue of The Astrophysical Journal Letters, we didn’t find any sign of infrared radiation in excess of the light from the star. Whatever caused the anomalous dimming of KIC 8462852 is not anymore orbiting the star up close, but must have receded to the frigid outskirts of the system, where any leakage radiation would be tuned to a wavelength much longer than the infrared radiation to which Spitzer is sensitive. This is hardly the behavior expected from a Dyson sphere closely encircling a star. Furthermore, an extensive search for extraterrestrial intelligence (SETI) transmission has so far failed to detect any signal coming from this system (the gamma-ray astronomy group in our department has also been involved in this search). If not aliens, what is then happening on the doorstep of KIC 8462852? We still don’t know for sure. The leading hypothesis is that the dimming was caused by the fragments of some small planetary body (a large asteroid or a dwarf planet) that had the misfortune to break-up along a highly eccentric orbit circling the star (such breakup events are rare, but not unprecedented). As the fragments approached their orbit’s periastron the furious radiation from the star could have caused ablation and sublimation of volatile elements from the surface of the fragments, leading to the formation of enormous and opaque streams of left-behind debris, capable to partially obscure the star. This process is not different from the mechanism in which Solar System comets form their dusty tails as they sweep around the Sun; it is just on a vastly more massive scale. 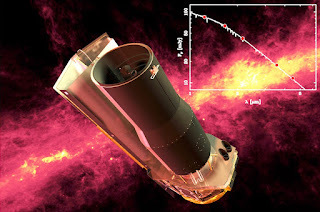 By the time Spitzer trained its optics toward KIC 8462852 the fragments and debris tails would have had enough time to travel along their orbit to the outskirt of the system, where not even the sensitive infrared detectors of Spitzer could have detected their residual heat. We still don’t know if this hypothesis will hold true: more data is needed to confirm or rule out this scenario. For this reason, we have launched an international effort to monitor the star from space and from the ground, hoping to catch a future dimming episode and perhaps detect the elusive thermal radiation that must be associated with it. In the meantime, KIC 8462852 remains one of the most mysterious stars in our Galaxy, a puzzle that has stimulated the curiosity of scientist and public alike, and that we hope will soon reveal its wondrous secrets. KIC stands for “Kepler Input Catalog” and the index code, despite appearances, is not a telephone number, although it does answers a landline in Pleasantville, IA (don’t try this at home). and that we hope will soon reveal its wondrous secrets. This article was first published on the 2016 issue of "Quanta and Cosmos", the Alumni Newsletter of the Iowa State University Department of Physics and Astronomy. This image is unrelated to the topic of the post but hey, this is my photoblog so I want to have a photo shot by me in it. Las Campanas Observatory, Chile. Note that KIC 8462852 is in the Kepler Field (in between the Cygnus and Lyra constellations), so it is not visible from the southern hemisphere.